Like everyone at the start of the school year, I am resolving to sleep better, eat better, exercise, save money, cure cancer and broker a Middle East peace deal. Some of these things will probably fall by the wayside, but every school year teachers all over the country make the same types of lists and are determined to succeed. One of the biggest issues I have is cooking. I am not a good cook. It is a struggle for me and so I’m always searching for that magic book or system that is going to turn me into the perfect cook. I have found a new system and I’m very excited about it. I’ll share more about it with you later after I try it out (you can see an example here) but last night I made my first recipe from the site and I loved it. This is as simple as it looks. Cook some ground beef with some olive oil. Add sliced zucchini and cook until they are “buttery.” Add some spices (in my case chili flakes, salt and pepper) and eat. 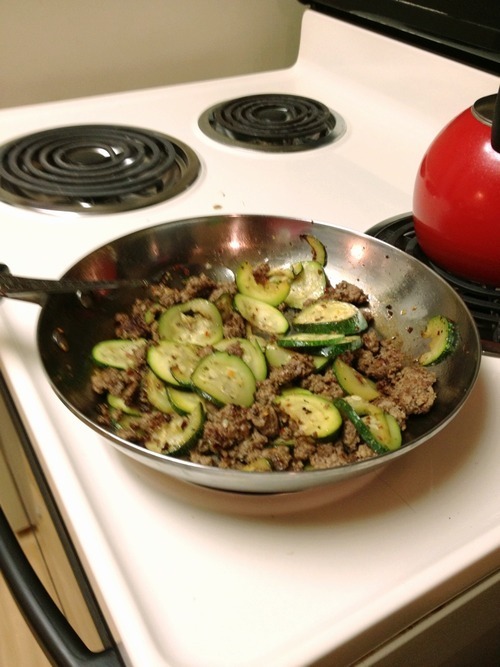 It was delicious, better for me than my comfort food Hamburger Helper (don’t judge), and when I was done I realized I ate a zucchini, just like that. Looking forward to trying the meal planning system and getting one of my new school year resolutions underway.